Introducing Phyllis Stewart – the newest member of our Wooden Spools team! You may not have met her yet – but you’ve seen her work! She designed our Row by Row pattern. I am so excited to begin sharing with you every other week! I have begun working with Vicki at Wooden Spools and am designing a few things for her and want to share some of those things as well as extra inspiration. I hope this blog will make you want to hug your sewing machine and start a new project. Each time I will try and share inspiring pictures, a little of my history and perhaps a pattern or two when the need arises. Most of my work is done with scraps and I tend to work in civil war fabrics but I also love batiks, solids, 30’s, florals…you get the idea. I love all fabric! 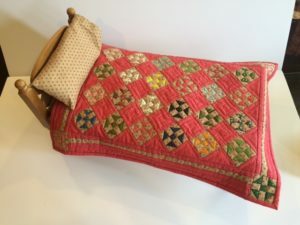 This week I wanted to share a few quilts from my doll quilt collection (over 200 quilts). Oh and did I mention that I belong to a small group of BFFs called Doll Quilt Divas? 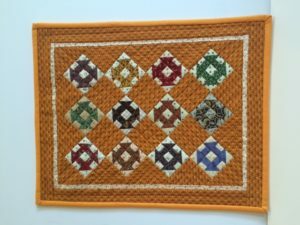 We get together once a month and make the cutest little quilts, often exchanging 9 patch, pin wheel, or churn dash blocks – or whatever the theme for the month happens to be. This one happens to be a churn dash. 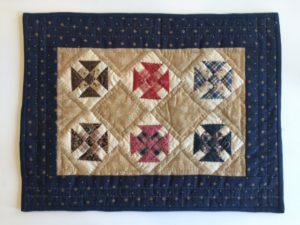 I have three quilts to share with you. The first one on the doll bed has 24 little 2” blocks plus 4 more (one in each corner). I like a little contrasting inner border to jazz things up. The next one is in my new favorite color: cheddar. Doesn’t it just set those little blocks off in an adorable way? This last one was made by Jane Dumler and I was fortunate enough to be the highest bidder at a quilter’s silent auction and got to take it home. If you are looking for a great pack of 5” squares in light and dark fabrics, check out Wooden Spools. You can come into the store, call or just click the link below to order! One Wooden Nickel Pack will make any one of these with 2.5” blocks.